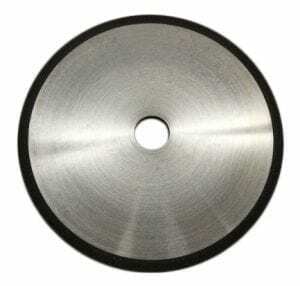 One of the best superabrasives available today is the Borazon wheel. It can withstand more heat than a diamond wheel, and boasts superior precision grinding. And when you purchase one through Eagle Superabrasives, you’re getting a high-quality product bundled with superior customer service. The Borazon wheel gets its name from the Borazon crystal, one of the hardest known materials available alongside diamonds and boron nitride. It was first produced in 1957 by General Electric physical chemist Robert Wentorf. By heating equal parts of boron and nitrogen beyond 1800 degrees Celsius, the resulting crystal can either black, brown or gold in color. Diamond wheels have long been an industry standard in grinding very hard super alloys. But because a diamond contains carbon, it was discovered that grinding steel at high temperatures would dissolve the iron. Because of this, aluminum oxide was used as an alternative abrasive on hardened steel tools. But Borazon’s far superior abrasive properties have replaced aluminum oxide as the ideal agent for grinding steel. A pure diamond can only withstand temperatures of 871 degrees Celsius. A Borazon wheel can withstand heat up to 2000 degrees Celsius, and still grind with a high degree of precision. Due to its superior abrasive properties and accuracy, a Borazon wheel is ideal for jewelry making, in addition to its wide prevalence in industrial applications. The experts at Eagle Superabrasives stock over 6,000 grinding wheels at our headquarters in Hickory, North Carolina. Custom wheels are made in as little as seven days, and most pre-made products are shipped same-day. We use polyimide, phenolic, metal and hybrid bonds to accommodate everything from manual off-hand grinding to the latest modern machinery. And with over six different core materials to choose from, our abrasives will last longer to increase your productivity and save you time and money. The friendly and knowledgeable staff at Eagle Superabrasives provide superior customer support. We even offer technical support and advice for any of your abrasive questions or concerns. Contact us today to experience our high-quality products and unparalleled customer service for yourself.